With cold weather approaching, it’s time for big bowls of soup. Way back in March, when it was chilly out, I had a huge amount of kale and some potatoes from the Greenmarket, and I got the idea to make caldo verde. Caldo verde is a traditional Portuguese kale soup I’ve seen Emeril Lagasse make on tv many times. But could it be made vegetarian? Looking at his recipe online, I was surprised to see that with one exception, which I will get to later, the dish actually was completely vegetarian — he calls for the use of water instead of broth. I knew then that it was possible. I started out by sauteing onions with olive oil in a soup pot, until the onions got nice and soft, and seasoned them with salt and pepper. Then I added a bunch of potatoes, cut into chunks, and covered everything with water. I brought that to a boil, and then simmered them for about 20 minutes, until the potatoes were soft. Now for the one change I made. In the original recipe, Emeril says to saute chorizo, spicy pork sausage, in a pan while the soup cooks. What I did was saute slivers of shiitake mushrooms with salt and pepper until they were crispy. For the spicy part I added some chili oil to pan. When the potatoes were cooked I mashed them up with a potato masher, and then I added a huge amount of thinly sliced kale to the soup pot. The original recipe says to cook the kale for five minutes, which sounded like to short an amount of time to get the kale tender. I was wrong — the kale was cooked perfectly in the five minutes, and still kept its bright green color. Then I dumped in the crispy mushrooms along with the spicy oil they had cooked in. 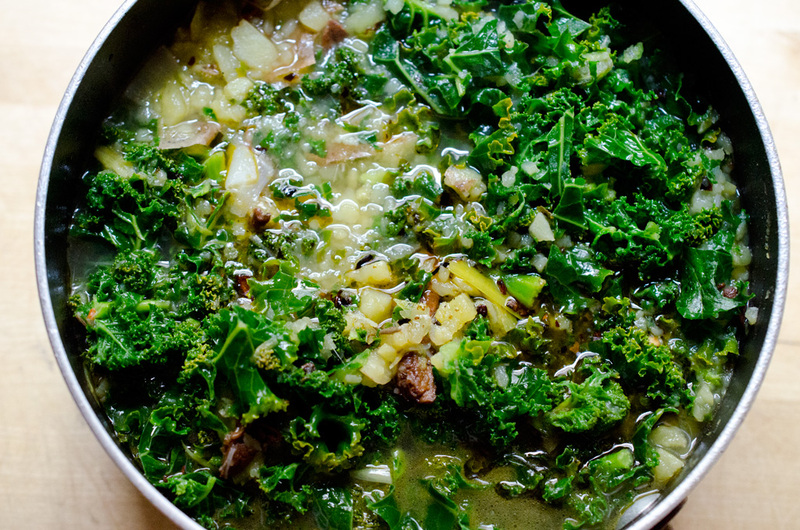 This final addition is what makes the soup; the broth itself is surprisingly flavorful just with the onions, potatoes, and kale, but the little crispy bits of mushroom and the heat from the chili oil make it something special. While sitting down to enjoy this hearty bowl of soup, I realized that not only was it vegetarian, it was vegan. It just goes to show how a few simple ingredients can come together to make something that is more than the sum of its parts; that’s what good cooking is all about.